I begin each year with a set of goals. I think about the things that I have always wanted to achieve with my students but have yet to accomplish. This year, one stands out in particular: fostering global awareness in the classroom and in the world of art. The approach I planned was first to think locally, then globally. A natural first step was to remove cell phones from the studio and art classroom, headphones included. Before the school year began, my colleague and I discussed the importance of building community in the art studio. In order to create the conditions for learning from one another through conversation, informal critique, and trust, we have to be present and available. At first, the students were skeptical. Now that a month has passed, they are more receptive. Being "DJ for a day" has evolved into a fun and exciting responsibility. A speaker in the studio allows individuals to share music and interests. Step number two, introduce "Pinwheels for Peace." 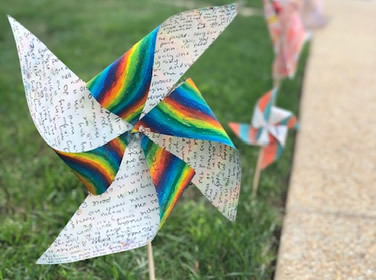 A two-sided pinwheel gave students time and space to think visualize peace and expressive their thoughts through a written and visual format. This project allowed me to see how the students approached a blank canvas and a prompt. Two-thirds of my students are new to me. This was an opportunity for me to work alongside of them, get to know them and witness their approach. International Day of Peace was on Friday, September 21st. Visual art students (8th-12th) participated in making pinwheels. We were part of a 40 million pinwheel worldwide installation! These pinwheels created a sense of play and curiosity for viewers walking by. With over 800 students and 150 staff members, our Visual Art students made quite an impression! We gave our school community a chance to experience art first-hand, outside of a "typical" setting and into their everyday world. During the opening days of school, the project called "Pinwheels for Peace". The students were charged with designing a pinwheel that had written reflections on one side, and imagery on the other. The project was a meaningful way to begin conversations about art and social awareness. This year I will be participating in a professional development conference with a focus on "Pedagogy and Peace." I look forward to gaining insight on how to prepare my students to be responsible and thoughtful members of our global society. I am excited for this school year and all of its possibilities!